AmpMe, the app that turns several phones into perfectly synchronized speakers for the same music, has seen many updates since its release in 2015. At first, the app only supported SoundCloud as a music source, but it has added local music and YouTube, and improved its app to synchronize Bluetooth speakers as well (with their delays). Now the service is adding one of its most requested features: Spotify support. You can choose to stream music from Spotify in AmpMe, just like you would choose YouTube or SoundCloud or your local library. But you will have to sign in with your premium Spotify account for that to work. That's basically a limitation of any third-party app that wants to tap into Spotify's library. The annoyance here is that even if the music party starter (main phone) has a premium Spotify account, all party participants (other phones) will need a Spotify premium account as well to join in on the fun. I think AmpMe requires that in order to play music on their devices too, it can't just send Spotify audio over the network like it does with local music. That's a big limitation on the usefulness of Spotify in AmpMe, but if your friends circle is full of people with premium Spotify accounts or if you have a Spotify family plan, then you can take all your phones and start a party. The updated AmpMe app is already live on the Play Store, so you can grab it there to get groovin'. You asked, we listened! We’re starting off the New Year strong with a brand new music source on AmpMe *drum roll* ...Spotify! YES, YES, YES, YES, YES!!! It’s music to our ears, and I’m sure it is to yours as well. Now go ahead and hit that play button! February 2, 2017 -- Montreal, Quebec – AmpMe, the app that allows users to play music in perfect sync across multiple devices to create one powerful sound system, today announced that users can now connect to the Spotify music streaming service in addition to existing music streaming services: SoundCloud, YouTube, and their personal music library. AmpMe allows Spotify premium users to sync their phones, tablets and Bluetooth speakers together, cranking the party up without limitations. Party participants simply log into their Spotify premium accounts in order to stream music from Spotify. The free app is now available in 144 countries around the world in the App Store and on Google Play. 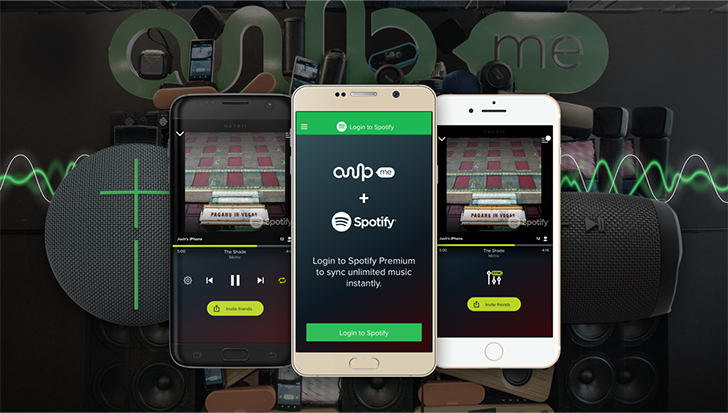 In addition to integrating Spotify, AmpMe is now more social than ever by allowing partygoers to see other participants who have joined the party. Connecting to parties is easy; the smartphone automatically detects nearby parties as well as syncs to any connected Bluetooth speaker already paired to an AmpMe enabled device. The only limit is the number of devices in the party with AmpMe installed. Surround yourself with sound. AmpMe uses mobile phones to turn your friends into a powerful sound system. Play your music in perfect sync across multiple devices to create a powerful speaker. AmpMe is based in Montreal, Quebec and has raised $10 million USD from leading investors Relay Ventures, Investissement Québec, Slaight Music, OMERS Ventures, Townsgate Media, Anges Québec Capital and Real Ventures. Bring your music anywhere. Be the Speakers. AmpMe respects intellectual property rights and encourages users to do the same by having fun with their friends and families in private.